Many people consider themselves cinephiles (which, in case you’re wondering, is a fancy name for a film buff), and show their love for movies in various ways. A select few collect mounds and mounds of memorabilia, while others have held on to every ticket stub for the past 20 or 30 years (a handful might even do both). As for me, I have this challenge of mine, as well as a DVD / Blu-Ray collection that numbers well into the thousands. For some, this might seem a bit obsessive (at one point, my wife threatened to walk out it another Amazon package showed up on our doorstep), but compared to the five New Yorkers we meet in the 2002 documentary Cinemania, I’m a total amateur. The quintet at the center of Cinemania: Jack Angstreich, Bill Heidbreder, Harvey Schwartz, Eric Chadbourne, and Roberta Hill, spend almost every waking minute going to the movies, and believe me when I tell you they see a lot of them. Jack uses an elaborate spreadsheet to plan his daily trips to the theater, and sometimes catches as many as five movies a day (he claims that, in one 8-month period, he managed to see 1,000 movies). As for Harvey, he’ll watch anything that’s playing (he’d recently caught a showing of The Amazing Crab Monster), and has memorized the running times of every film he’s ever seen. Eric is the only one of the group who watches movies at home, and owns thousands of videos. As for Roberta, she’s spent the last 50 years collecting every bit of movie memorabilia she’s come across; ticket stubs, plastic cups, fliers, and even a bottled water promoting a film titled Water! It’s an obsession that makes huge demands on their time. 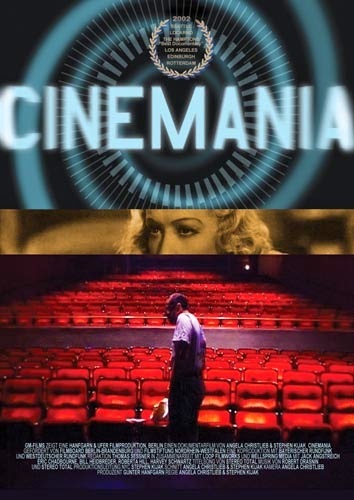 Not that it matters much, seeing as they have nothing but time on their hands; when Cinemania was produced, none of the five were employed (Eric, Harvey, and Roberta collected disability, and Eric’s unemployment benefits were about to run out. Only Jack, who was living off an inheritance, was financially secure). As you’d expect, this passion of theirs puts a damper on their social lives (meaning they don't have one). Jack confessed he no longer attends weddings or funerals, and won’t even visit sick friends in the hospital because doing so would disrupt his screening schedule (Bill gave up thoughts of becoming a lawyer for much the same reason). Even when it comes to matters of the heart, the cinema takes center stage (Eric was very upset the day Audrey Hepburn died, while Jack, a big fan of Orson Welles’ The Lady from Shanghai, says he’d like to make love to Rita Hayworth, but only if he could do so in black and white). More than a hobby or even an obsession, movies have taken control of every facet of their being, and not a single one of these five movie fanatics has found a way to relate to the world outside the cinema. The question you have to ask yourself after watching this fascinating documentary is: Do I envy these 5 intense film buffs, or pity them? The answer to that query will ultimately say something about your level of Cinemania. As for me, I couldn’t help but feel a little of both.